Graham Richards remembers the moment nine years ago that he was walking down Hayward's B Street and saw a sign outside a pub advertising live music, barbecue, and beer all day. Intrigued, Richards walked in, and in a figurative way, never walked out. "My palate was spoiled forever," said Richards, a Hayward pianist and music teacher. "I've never gone back to normal beer." For that February day in 2002 chanced to be the day of The Bistro's second annual Double IPA Festival, then in its infancy and now the biggest festival of its kind anywhere. The event recently came and went for the eleventh time on February 12, attracting 3,000 people — the most ever — to indulge in five dozen of the best, and some of the bitterest, Double IPAs in the world. The festival's growth, from a grassroots beer tasting bar party in 2001 to the sensation it is today, simply reflects the growth in popularity of the Double, or Imperial, IPA itself. The style is marked by high alcohol, often 9 or 10 percent, and intense bitterness. Other "extreme" beer styles are equally strong, including barleywines, imperial stouts, and Belgian-styles, but unlike those big beers, Double IPAs — often called DIPAs — are swarming with the freshness and fragrance of hops. "Imperial stouts and barleywines are great beers, but they're so heavy, so malty, that you can't have more than two or three glasses," said Bistro owner Vic Kralj. "But IPAs, even Double IPAs, are refreshing." Hops exert an almost universally appealing power over the human palate, and the IPA, a style based largely on bitterness, has become the most loved beer in America over the past fifteen years. Now, the Double IPA is riding high on the same wave of popularity. Many sources say that brewer Vinnie Cilurzo, then at Blind Pig Brewery in San Diego, made the first one. Subsequently, in 1999, after opening Russian River Brewing Company in Sonoma County, Cilurzo brewed another Double IPA, a grapefruity, fragrant beer of 9 percent alcohol called Pliny the Elder. Though many scores more have arrived in the years since, thousands of people still regard Pliny as the very best Double. "That's my beer," said John Popovich, a musician and part-time bartender at the Bistro, who says he drinks almost nothing but Double IPAs. But, as much as the quality of the beer itself, mystique and marketing have likely contributed to Pliny the Elder's reputation. "It's a combination of limited supply, Vinnie's pioneering history as the guy who invented the Double IPA, and it being a really good beer," said Dave McLean, owner of Magnolia Gastropub & Brewery in San Francisco and one of the principal organizers of SF Beer Week. McLean calls Pliny the Elder a "masterful expression of a hoppy beer." Though Pliny receives frequent compliments for its balance between aromatics, stinging bitterness, and high alcohol, the beer isn't always available — a shortage of supply that stirs excitement when the beer arrives in the outlying regions of its distribution area. Her in the East Bay, retail supplies run out quickly, and kegs often go dry after just several nights at popular bars. Triple Rock Brewery in Berkeley recently ran out of a seasonal DIPA, but head brewer Rodger Davis — sensitive to consumer demand — had timed his brewings to have two more ready to go. One is called Hop Soup, a classic American Double IPA — piney, fruity, and bitter. The other is called Hopfensuppe, essentially the same beer but brewed with native German hops for a grassy, gentler burn. Both these Double IPAs are now on tap, offering tasters a side-by-side look at hops grown half the world apart. Davis says he used to brew a Double IPA as an annual event; now, he keeps one on tap most of the time. At Beer Revolution, too, Double IPAs are virtually always available among the shop's four hundred bottles. Patrons have a good chance of finding one on tap on any given night. The Denogginizer from Drake's is a year-round DIPA, available at the brewery's San Leandro taproom and in bottles at most better beer stores. Among many craft brewers, size matters, and Double IPAs have led to Triples — monstrous tempests of hops and alcohol best exemplified, perhaps, by Founder's Devil Dancer Triple IPA, Dogfish Head's 120-Minute IPA (a 20-percent alcohol beer), and, no less, Pliny the Younger, the successor of Pliny the Elder and a beer whose popularity has exceeded that of its forefather. Russian River releases the Younger just once per year, prompting hundreds of fanatics to queue up on the sidewalk at dawn, wearing Pliny the Younger T-shirts and holding empty growlers soon to be filled with the oversize beer, which Richards says "tastes like a great big mango smoothie." Pliny the Younger arrived in early February, just in time for the Bistro's festival, where it and more than a dozen other Triple IPAs appeared this year among the sixty-something Doubles. Will we next see a Quadruple IPA? We already have — sort of. The lone specimen was made by Brewdog, an irreverent yet innovative brew duo in Scotland that employed a trick called "freeze distillation" — illegal in the United States — on a strong batch of IPA; they placed the beer in an ice cream freezer, where subfreezing temperatures drew out its water as ice crystals, leaving an enriched version of the beginning IPA behind. The compacted product measured 41 percent alcohol, arrived under the name Sink the Bismarck!, and wore a price tag of about eighty bucks for a 330-ml bottle. Many critics have claimed that the Bismarck's production process technically disqualifies it as a "beer." The trend toward gigantism in brewing has become so cloyingly prominent — almost a craft beer cliché — that, like all expanding universes, the extreme beer market may soon implode. Even devotees of big brews are now considering beers with less alcohol and more drinkability — a term often used by mainstream lager advertisers but which could find relevance among craft beers. "Because you can't knock down Pliny the Elder all evening," said Richards, who anticipates a cultural reversion to the so-called "session beer." McLean expects the same. 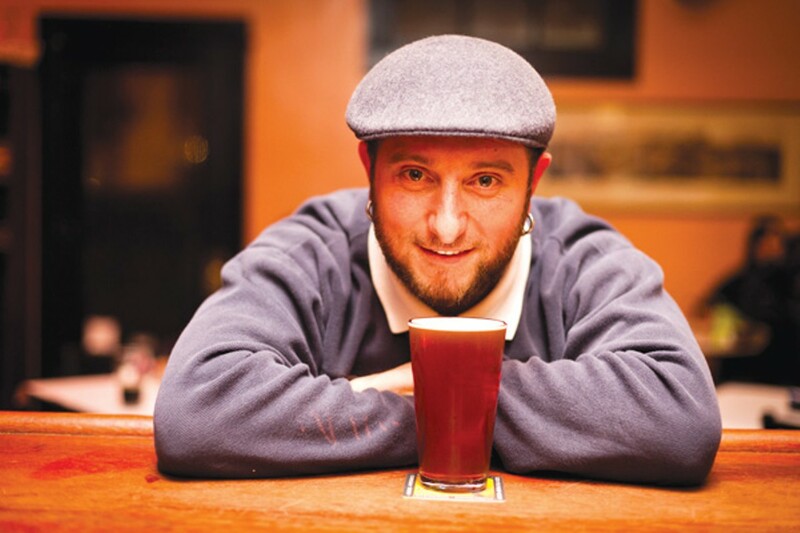 "The idea to go out and drink nothing but Double IPAs is part of a drinker's maturation," he said. "It's like the kid-in-a-candy-store phase, and eventually you realize you can't have candy every day for breakfast, lunch, and dinner." McLean recalls the 1980s and 1990s, when brewers often had to convince their customers to be adventurous and step from lagers up to comparatively bitter pale ales. The taste for flavor — especially hops — erupted like a prairie fire and edged light lagers from the diets of many beer drinkers. An international craze for bigness was born, and it has blown through the roof. "We created a monster in the drinking public," said McLean, who believes that, in time, it will be easy to coax drinkers back to more restrained styles. That's where McLean has spent the extreme beer era — in the basement of Magnolia, brewing his signature 3-, 4-, and 5-percent alcohol ales. Each year in February, he participates in Strong Beer Month, when six of his draft handles tap beers of 8- to 11-percent alcohol, including an annual barleywine called Old Thunderpussy. And as quickly as these beers fatigue the palate and send patrons home on wobbly legs, their kegs run dry, and the month of March brings Magnolia's patrons back to the solid ground of the session beer. "I see the arc [of extreme beers] peaking, tapering off, then finding a new equilibrium where extreme beers and session beers both find their logical and appropriate levels," McLean said. A recently released beer from 21st Amendment — the Bitter American — is a 4-percent alcohol session beer brewed, its makers say, as an answer to the sometimes overwhelming beers of today. Dan Del Grande, owner and brewer at Bison Brewing, also has seen an increased demand for "sessionable beers" — especially in the American East. He says that in Georgia, South Carolina, and Florida, his 5-percent alcohol honey basil ale is his most popular beer. He also answers the call for session beers by resurrecting a light and summery saison that he hasn't brewed for several years. But Del Grande hasn't overlooked the Double IPA craze, and he is about to introduce one of his own. At the Bistro in Hayward, DIPAs are all Popovich wants. He sees no turning back to the session beer, and he assures that one can knock down the Pliny the Elder all evening. "You just need to pace yourself, eat food, stay hydrated," he said, speaking like a sports trainer. "People want big beers. That's where the flavor is, and people won't go back to less once they've been spoiled. Brewers have opened a door that no one wants to walk out of."